Emma Pettey is a Senior Inclusion Advisor at CBM’s Emergency Response Unit. 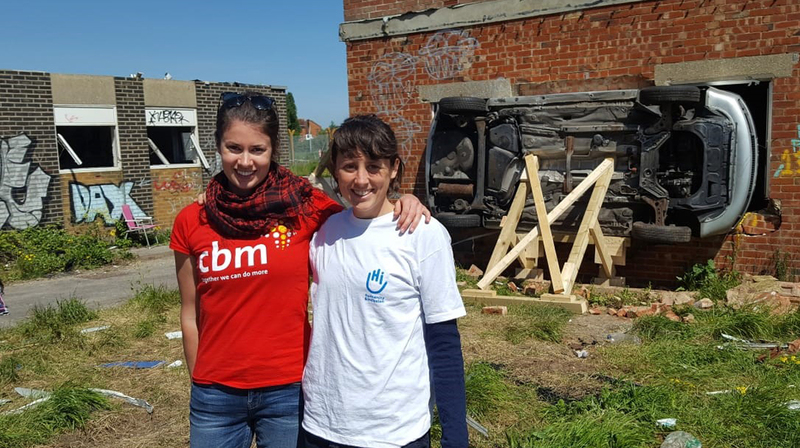 In this blog, she talks about taking part in a the recent disaster response simulation exercise organised by SimEx to help ensure people with disabilities were included. 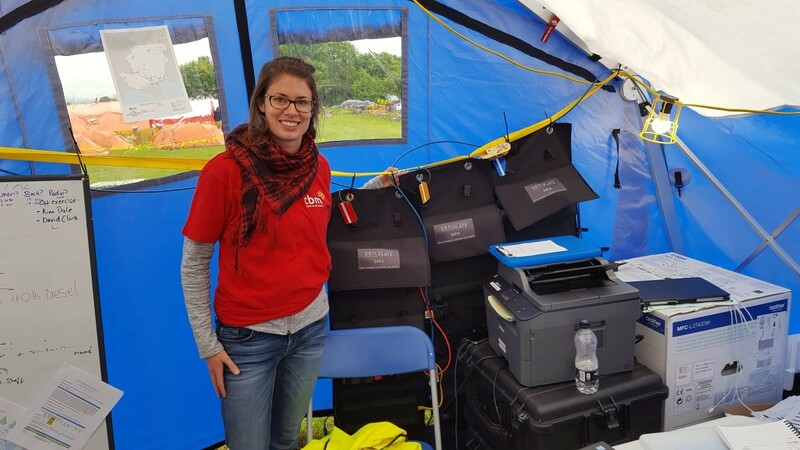 SimEx is the UK’s largest annual international disaster response exercise. It is an operational (live controlled) field exercise designed to establish a learning environment for players to exercise disaster event response plans, policies and procedures. SimEx 2018 took place May 15th to 17th in Portsmouth. The lead agencies were the University of Portsmouth, Hampshire Fire and Rescue, RedR UK, and L2S2. The primary scenario for the simulation was a slow moving, high pressure weather system which brought heavy winds, rains and storm surge resulting in coastal and inland flooding with associated infrastructure damage. National and International inter-agency tools, processes and communication were tested through a series of ‘modules’, (tasks and activities carried out within the simulation scenario in line with all objectives). The SimEx ran for three days. 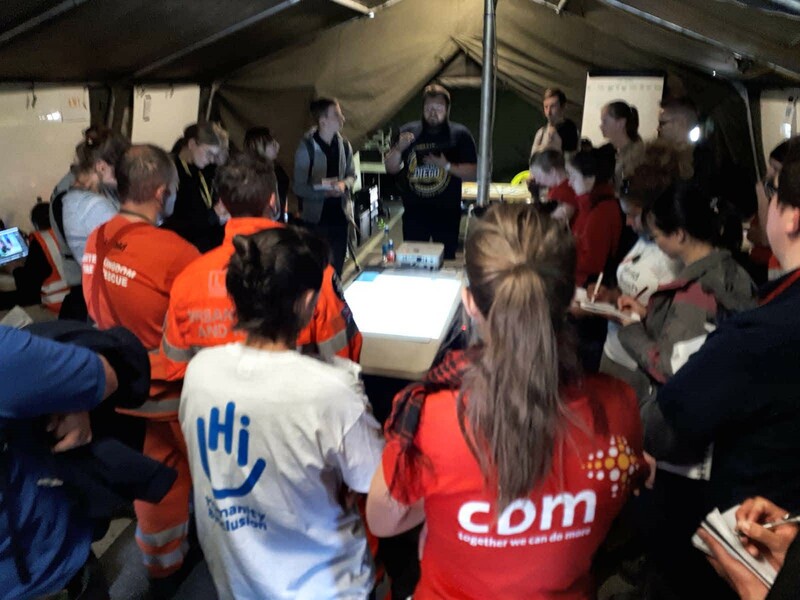 2,000 participants remained in the scenario for the duration, with a range of modules and injects taking place across the identified 12 sites using over 400 role players. In July 2016, the UN Inter-Agency Standing Committee (IASC) established a Task Team for a period of two years (2017-2018) to develop IASC Guidelines on Inclusion of Persons with Disabilities in Humanitarian Action. The IASC Task Team was invited to participate SimEx, in order to ensure that the exercise derives learning around the inclusion of persons with disabilities in an emergency response. The objective of the IASC task team’s involvement was to test the impact of the provision of technical support to coordination mechanisms through existing tools developed at the global level to foster inclusion of persons with disabilities. 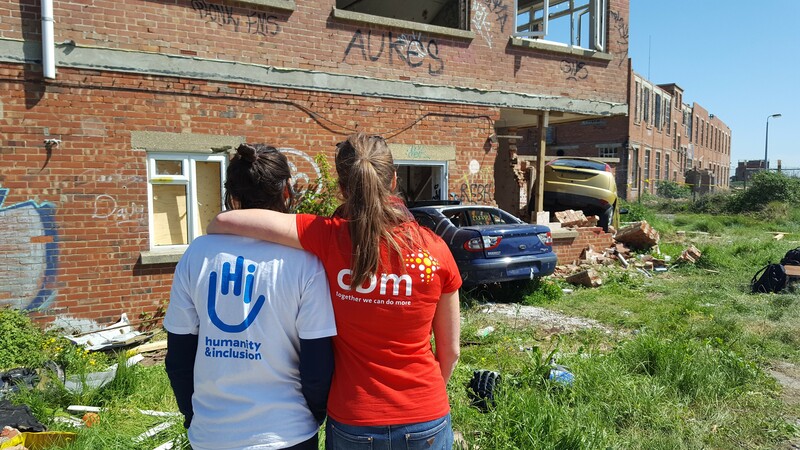 As part of the UN Inter-Agency Standing Committee (IASC) task team on Inclusion of Persons with Disabilities in Humanitarian Response, I recently had the opportunity to participate in SimEx, the UK’s largest annual international disaster response exercise. In response to a slow moving, high pressure weather system which brought heavy winds, rains and storm surge resulting in coastal and inland flooding with associated infrastructure damage, I deployed as CBM’s Senior Inclusion Advisor to the country of “Mas” alongside my colleague Sien Andries from Humanity & Inclusion (HI). Our role was to provide guidance to responders to adapt their activities and assistance to effectively identify persons with disabilities and ensure that they are able to access assistance and protection with safety and dignity. After clearing through the “airport” where we had our bags searched we set up camp with the other NGO participants. I was glad to see that Mas was finally getting some sunny weather as I didn’t feel like testing out the waterproofness of my new tent. After a quick lunch, we got word that there was a need for international response at the Ifosholo Camp, so headed off to the camp with the other agencies to assess the situation. At the Ifosholo Camp, we were greeted by UNHCR, who informed us that the shelters the internally displaced people (IDPs) had been staying in were all destroyed in the storm, along with the other facilities in the camp. Save the children began registering the population so that they could access aid. I stayed with them to ensure that people with disabilities were included in the registration process, while Sien set off for the first coordination meeting. As Inclusion advisors we were present at both the coordination and field levels to provide technical support on the inclusion of persons with disabilities in the humanitarian response. Physically inaccessible infrastructure, inaccessible communication materials, stigma and many other barriers commonly exclude persons with disabilities from being properly identified and included in the humanitarian response. We worked with the other agencies to incorporate questions into their assessment tools to help them identify people with disabilities during their assessment, and introduced them to the Humanitarian Hands-on Tool (HHoT). HHoT is a smartphone app which provides step-by-step guidance on how to implement an inclusive emergency response. Broken down into “task cards”, humanitarian workers in the field can easily search for practical guidance on topics such as inclusive camp coordination and management, health, shelter and more to ensure that their responses are designed to be inclusive for all people. When community leaders raised concerns regarding lack of access for persons with disabilities, we supported the other participants to lead a meeting with representative role players with disabilities, prompting questions to highlight their barriers to accessing services and solicit their suggestions to make the response more inclusive. We also joined an event where unaccompanied children who left an orphanage during a storm were identified to provide technical support to the responding agencies to ensure that children with disabilities were properly identified and included in the response. Overall, it was great to see the eagerness of other players to ensure their responses were inclusive of persons with disabilities, and the positive response towards the technical advice and tools presented. Many organizations even requested technical assistance and training from CBM and HI outside of the SimEx on inclusion for their staff/students and into their tools. We are looking forward already to SimEx 2019 and the opportunities it will bring! CBM and HI technical advisors provide technical advice on inclusion of persons with disabilities during camp interagency coordination meetings. Unaccompanied children who fled from an orphanage during the storm were located. 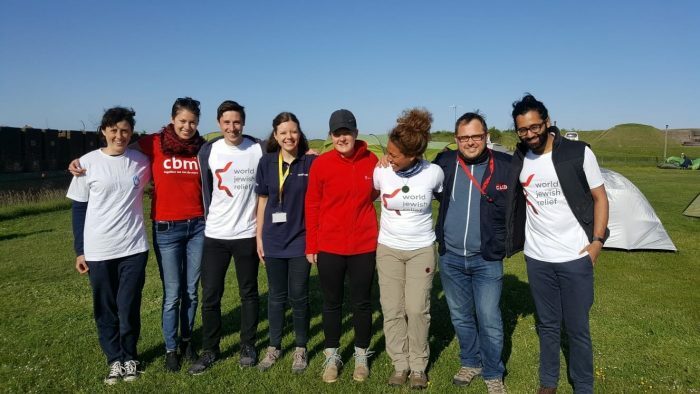 CBM and HI technical advisors arrived on site to provide technical support to Red R training participants and Save the Children to ensure children with disabilities and injuries are properly identified and protected. CBM and HI technical advisors observe the damage caused by the storm in Mas.